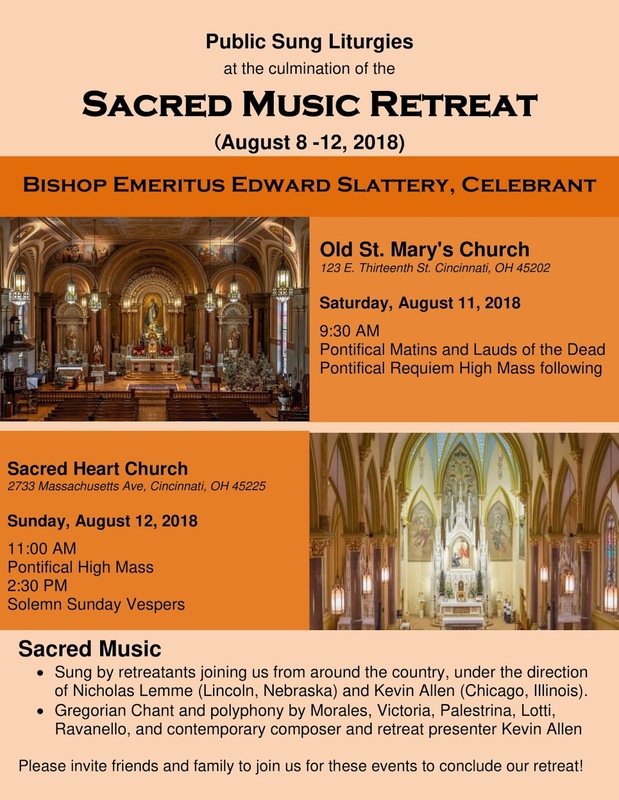 A Sacred Music Retreat for the Extraordinary Form takes place this week in Cincinnati, culminating in the following public liturgies at churches administered by the Oratorian Community of Cincinnati. • Matins and Lauds of the Dead (Pontifical) – Old St. Mary’s in Over the Rhine on Saturday, 8/11 at 9:30 a.m.
• Sunday Mass (Pontifical) – Sacred Heart in Camp Washington on Sunday, 8/12 at 11:00 a.m.
• Sunday Vespers (Solemn) – Sacred Heart at 2:30 p.m.
All are welcome to attend these liturgies, which will be sung by retreatants from around the country, and which will be directed by Nick Lemme (Lincoln, Nebraska) and Kevin Allen (Chicago, Illinois). 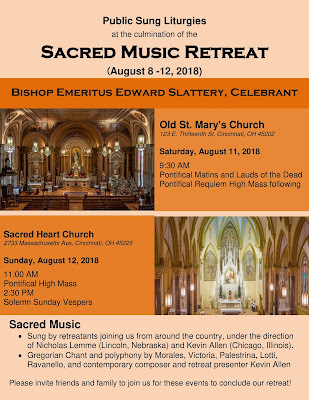 The music will include Gregorian chant, and polyphony by Morales, Victoria, Palestrina, Lotti, Ravanello, and contemporary composer and retreat presenter Kevin Allen. Information regarding the liturgies and parking for both churches can be found at the Sacred Heart website: https://www.sacredheartchurchcincinnati.com/.